It looks like this may repeat again. I'll record it and watch again if it does. I didn't catch the beginning. TM? Did you remember the Suzuki on the beach? They've been on the jawbone now and more recent news. I swear, I have absolutely no confidence at all in their report that the bone was not Natalee's. Yes, I remember the fishermen reporting it...but I'm vague on the rest. There was a lot of discussion about it iirc. You've got a good memory, TM!! I had forgotten it! They said a vehicle of that description was confiscated at the VDS home. Did it belong to Paulus? Seeing van der Straaten just makes me mad all over again! I'd forgotten what is voice sounded like. Seeing van der Straaten just makes me mad all over again! I'd forgotten what his voice sounded like. I KNOW!!!! I had the same visceral reaction!!! The only vehicle similar I remember was the red jeep like vehicle, with a white top. And I remember it being discussed that the front passenger seat was missing in the jeep. I don't remember where that info came from though. I've got some dog wrestling to do before I go to bed. I'd like to be settled before this comes on again......... let's see how much of a reality that becomes! If I get back tonight, I've given up finding a place on the bed with a Shar Pei and a HUGE Bull Mastiff whose head weighs more than my leg! My son OWES me for this babysitting duty!! "Bubba" likes to lay that Big Ole' Head ON me when he sleeps, and I'm pinned!!! Night TM!! Thanks for the help!! These are the other snapshots I took from a video of the Vandersloot vehicles being taken in. Good night CBB! You're a good momma! It's weird how early it was reported that one of the suspects allegedly confessed that Natalee's body had been dumped in a swamp on the island. That happened when the security guards were released. Did they say dumped in the swamp? I remember that one of the suspects was leading ALE to the body and I assumed it was near the Lighthouse. I thought Dave H headed towards the lighthouse that night? Holloway's family rushed late Friday to an old stone lighthouse beside Arisha beach after Deputy Police Commissioner Gerold Dompig told The Associated Press that one of three young men in custody admitted that "something bad happened" to Holloway and was leading police to the scene of the alleged crime. In January, the Crimson Tide kicked off the year, hailing a historic milestone that led Alabama to the national championship, defeating Texas, 37 to 21. Also, in Hoover, a massive fire at the Days Inn killed four college students. Investigators believe it all started with burning incense lit by the hotel's maintenance man. In March, Mountain Brook attorney, Major Bashinsky, topped our newscasts after he reportedly staged his own death to look like murder. In reality, he'd committed suicide. His body was later found in a pond at the Highland Golf Course. In April, Birmingham’s former mayor, Larry Langford, swapped his business suit for an orange jumpsuit, kick-starting a 15-year prison sentence for various charges, including bribery and conspiracy. Just days later, a coastal catastrophe ensued… BP's deepwater horizon exploded, killing eleven men and creating the biggest oil spill in U.S. history. Three months later, the leak was capped, but its existence is still wreaking havoc on the Gulf Coast economy. On the five year anniversary of Natalee Holloway’s disappearance, the man accused of killing her, allegedly killed Peruvian student Stephany Flores. 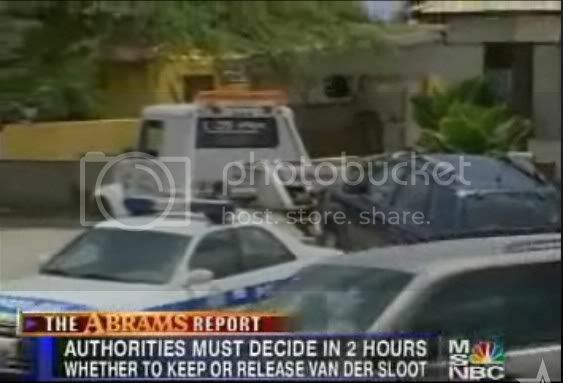 Joran van der Sloot is later charged with extorting money from Holloway’s parents. Over the summer, we witnessed an exodus of sorts in Alabama’s casinos. Governor Riley's Anti-Gambling Task Force paved the way for raids across the state, including Greenetrack and VictoryLand. It created the seizure of thousands of gaming machines and the loss of hundreds of jobs. All the politics surrounding gaming eventually led to the indictment of eleven people, for allegedly buying votes to bring bingo back to 'Bama. Among those arrested were four state senators and two casino owners. Politically, 2010 is a year that will go down in history. For the first time in over 130 years, the GOP gained control of the Alabama Legislature. In addition, voters elected Doctor Robert Bentley as our new governor. But he wasn't the only one making the headlines... Gabe Watson stole the show in December, returning to Alabama after an 18-month manslaughter sentence in Australia. Watson is accused of killing his wife Tina while scuba diving on their honeymoon in 2003. And, Cam Newton became a household name. The Auburn quarterback led his team to an undefeated season, but not without scrutiny... The NCAA questioned his recruitment after an alleged pay-for-play deal. Fortunately for him, he was deemed eligible, and soon after, named the 76th Heisman trophy winner. White Suzuki? Red Suzuki? Red Jeep? On May 29th 2005, at approximately 16.00 hours, I went with Joran to the “Free Carribean Stud Tournament” in the Holiday Inn. During the break, at approximately 18.30 hours, I went back home. My youngest son Sebastian who was playing at a friends house was due to be dropped off at home around that time. Joran, with my permission, took over my seat because he had been eliminated earlier. We had agreed that he would call me after the tournament, in order for me to come and pick him up. He did indeed call me and at approximately 23.00 hour I picked him up near the Mc Donalds in Palm Beach with my red Suzuki. We drove home and I went to bed. I dropped off Joran in front of the entrance of the Aruba Raquet Club with my Suzuki so that he could take tennis lessons and go to the gym. He probably had his carrying bag with tennis necessities with him. I saw him enter the building. He had told me that he would afterwards be going to the Wyndham Hotel because a “Free Carribean Stud Tournament” would be held. I immediately went home, had dinner with the other boys and after that I went to bed. We just recieved a call from Tim Miller of Texas Equusearch. Tim is presently in Aruba and planning to meet with the Aruban prosecutor and the ALE. 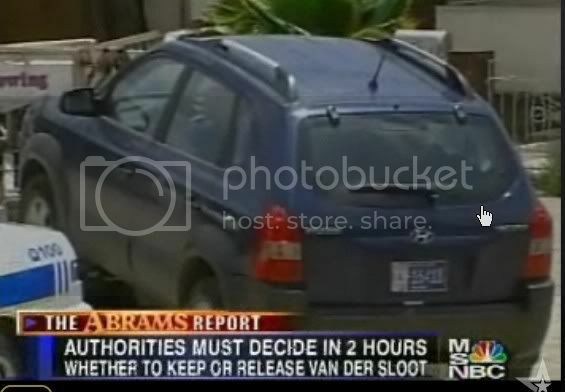 It appears that there is a new witness that has come forward that has placed Joran Van der Sloot in wet and muddy clothing out at 4:00am on 5/30/05. 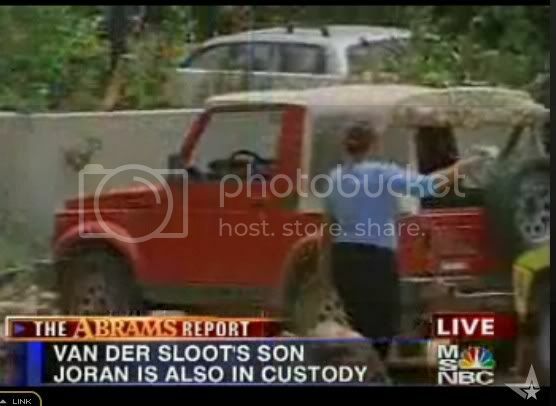 The 48 year old Aruban witness also places Paulus Van der Sloot at the scene picking up Joran in a red jeep. Aruban authorities spent several hours Wednesday searching the house of the Dutch youth in the upscale Noord neighborhood. They carried away items in paper bags and cardboard boxes and towed away a blue sport-utility vehicle and a red Jeep. The search came a day after police combed a mangrove swamp near Holloway's hotel. Police suspended that search after pumping water from a drainage pond. Beth Holloway: Jan van der Stratten is corrupt to the core of his existence. He just doesn't deserve any more words..
DANA PRETZER SHOW FEB 13, 2008 WITH BETH HOLLOWAY, PETER R. DEVRIES, AND MORE! Due to the circumstances surrounding Natalee's death, trust will always be an issue, CBB. Even when there are times the truth is told, it will always be suspect. There is supposed to be some truth in everything. What is the truth here? How can we ever know? Start out with the truth, and there is no reason for suspicion. She's beautiful and so is the work surrounding her.